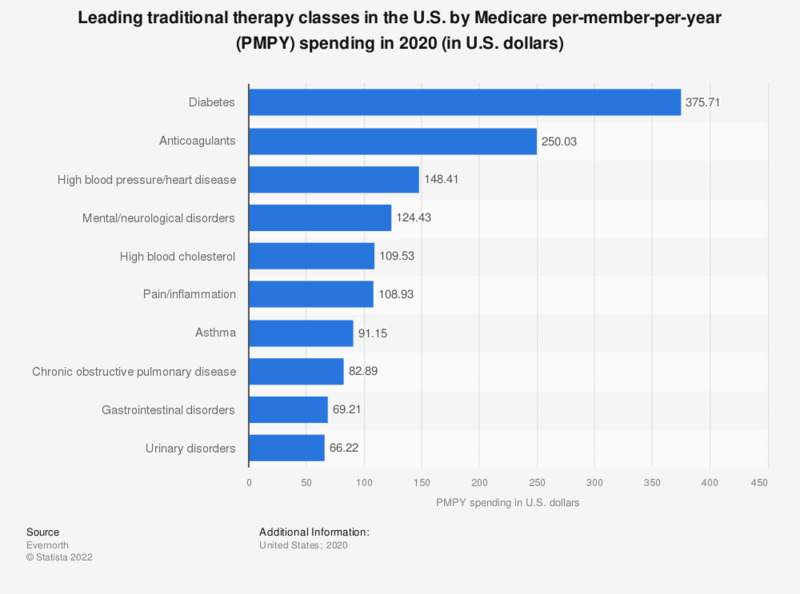 This statistic shows the leading traditional therapeutic areas in the United States in 2016, based on Medicare's per-member-per-year spending. Diabetes had the highest spend, costing Medicare almost 440 U.S. dollars per year and member. * PMPY metrics are calculated by dividing totals by the total number of member-months, which is determined by adding the number of months of eligibility for all members in the sample. This statistic includes members with coverage for Medicare beneficiaries. Medicare beneficiaries included in this analysis received their prescription benefits from the following plan types: Medicare Advantage Prescription Drug plans (MAPDs), Prescription Drug Plans (PDPs) or Employer Group Waiver Plans (EGWPs).